I adore corn. It's funny because I'm not a huge fan of cornbread but I adore most corn dishes. My favorite is probably the Creamed Corn recipe I shared last year but some very annoying people pointed out we've already had that a lot so I was tasked with coming up with a new corn recipe. 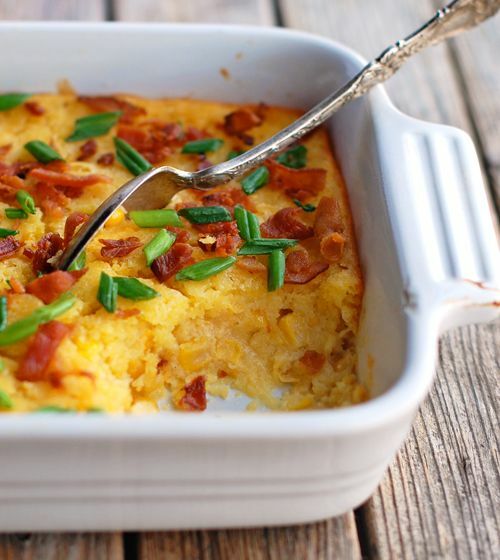 This one will do it for me and make some of the corn bread lovers happy. Stir in corn bread mix and both corns. Mix well and pour into greased 2 quart (8x8) casserole. Sprinkle on toppings and continue baking for 10 more minutes (unless using scallions - sprinkle those after removing from oven). Corn is done when the middle is set. I don't need the bacon but I enjoy scallions so I'm always okay with adding those. French friend onions are a take them or leave them type of thing. Give me corn any day. I love corn on the cob, corn pudding, creamed corn, plain corn, corn chowder, occasionally a good corn bread but do not put ham in my corn bread... that is something else my siblings like and I'm not in favor of that. Ruins perfectly good corn products. Yummy yummy! And, I think I can get the corn mix on an online American shop I've used before. Corn bread mix is American? I had no idea. I mean I guess so we are big into corn here. Still I never thought it was an American thing. I hope you can get it and it isn't expensive. I also hope you find this dish delicious too. I have to say... I've been reading Trisha Ashley's books (she's a British author) and a lot of hers are Christmasy and talk about food over there. I want to eat some of these dishes. They sound delightful. I'm particularly interested in a Traditional Triffle. I was thinking about trying it but it sounds hard. Oh Trifle is yummy! And not necessarily hard to make. I'll see if I can find a nice, easy recipe for you. There are so many variations of it, that you can adapt it to suit your own tastes and shortcuts so it's not something that is hard to make. It is though I hope you find that to be true too. I can't wait to see the recipe. I might have to wait for our big family dinner but I want to try it. Okay, so this is a classic recipe for trifle. Yes, it has multiple steps but those can be made easier if you use things like ready prepared custard, if you have such things in the US? Same goes for the jelly, we can get it in cubes that you just melt and then set. You don't have to go through the whole of steps 1 & 2 that way. But it's up to you whether you want to try a cheats way and combine the two or attempt the recipe as it is. I guess it depends on how comfortable you are with improvising. But, as is with most things, following the recipe as it is, you will reap the reward of a divine traditional type trifle. Also, there are loads of different trifles you can try that follow the basic ingredients of cake, jelly, fruit, custard and cream. This site gives many recipes to the myriad of alternative trifles you can try. I can improvise though some of the ingredients stump me. I mean I don't know what Madeira cake is. But I'm going to do some more investigating because I'm okay with improvising. I bet I can come up with something very close if not right on. If I accomplish it... I'll post. As for Madeira cake, it's a sponge. So just a basic vanilla sponge cake would do. You don't want a cake that is heavily flavoured. I hope you do and let me know how it turns out. I still haven't accomplished this but I haven't had the time. I still want to though.